Seeking Personal Freedom begins when we are young and starting to form our own beliefs and directing our behaviors independent from the commands of our caregivers. As we age the impulse becomes more distinct, powerful, and intellectual, we consciously decide that we want to stand on our own, find our own way, chase our own dreams, break down our own boundaries, take a risk, start a new career, we choose what excites us, and what makes us sad etc. The problem is that our seeking is tragically interrupted in our lives, again and again, stolen by our own fearful thinking. The difficult task here is to defeat social oppression, the caging of our own spirit and the stifling of our potential by others. In the book the Motivation Manifesto by Brendon Burchard, the answers for many questions about the meaning of life are to be found. 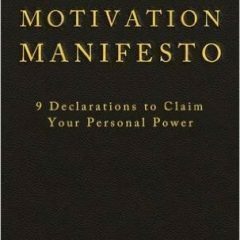 The Motivation Manifesto is like a bible of inspirational and motivational quotes but also the ultimate guide to becoming a better person, successful entrepreneur, or just simply find the meaning of your own life. Sometimes we don’t know ourselves as much as we think and with a little help of some knowledge, it could completely change our lives around. Brendon Burchard is also the World’s leading high-performance coach alongside with Tony Robbins. Success Magazine named him one of “the 25 most influential people and one of the most watched, followed and quoted personal development trainers in history. He’s been also well known for being an Online Marketing and Social Media Expert when it comes down to business and entrepreneurship. He met and coached some of the biggest celebrities and most influential people in the world such as America’s presidents, Hollywood actors, spiritual leaders, or successful businessmen to overcome their fears and boundaries and become exponential. Brendon Burchard is also a creator of over a dozen Personal Development courses, and up to this date, well over a one million of students completed his online courses. People can also attend Brendon’s live events. One of the Brendon’s most successful online courses is called Total Product Blueprint and has helped thousands of people to start and launch their business. Total Product Blueprint and Jeff Walker’s Product Launch Formula are the best online courses to start and build a successful business from the scratch using a power of the internet. Click the Link to Learn more about Total Product Blueprint or read Total Product Blueprint Review. Brendon’s Motivation Manifesto book will show and help to discover your own desires, goals, and achievements, to motivate you to progress in life. It’s the progress that makes us happy and feel good about ourselves and our environment. If we do not have a progress, we feel stuck, stressed, and frustrated. This book is for people who want to feel alive again and open their mind to become highly motivated and happy in life. 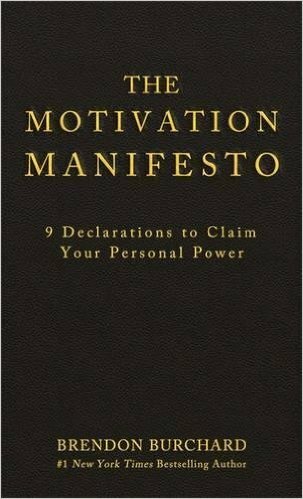 Change your life for the better and forever with The Motivation Manifesto. It’s true that not everyone likes or prefers to read, so that is why audio books are very popular between the young and middle age busy generations. YOu can listen to your favorite story or speaker while driving, walking, cycling or running.